OT: my husband wants some track pants for christmas that are "not too slippery, too warm, or too tight", for running and playing basketball in non-summer months - but in CA so not very cold. does anyone have any suggestions??? i am thinking lulu must have something good (my brain is kind of one track when it comes to workout clothes), but he couldn't care less about the brand, so other suggestions are welcome too. My hubby LOVES his Seawall Track pants, but he's very particular that they must be UNlined. The lining makes him too warm (even in our cold snowy winters). Granted, we're in WI; but he'll wear them in the summer if he needs pants for something. His other love are the Kung Fu pants. I feel like they are heavier than Seawall since they are luon, but I know he likes them. He also has a pair of North Face pants that he likes. They are like Seawall Track pants in material, but even lighter weight. I'll be darned if I can remember the name, though. :( But maybe a browse through a North Face section might be in order for you. G'luck! My hubby loves his pants from Road Runner Sports. Plus, if you go on Road Runner through ebates.com (free to join), you can get some cash back. I also go through ebates any time I order stuff from Banana Replublic, Nordstrom, Piperlime, etc. Road Runner has a wide variety of track pants for men. If he isn't particular, you may as well save $ on him so you have more Lulu bucks, lol! Women with breasts need not apply. @ anon 2:26 pm - too true! I wonder why they deleted the Shanti Cross Back top. At least that fit a little larger breasted woman. That triable top is insanely small. thanks ladies for the mens track pants suggestions! i love the suggestion to get him generic kind so that i have more lulu $ for myself. LOL. Australia is so lucky. girls with need not apply is right. 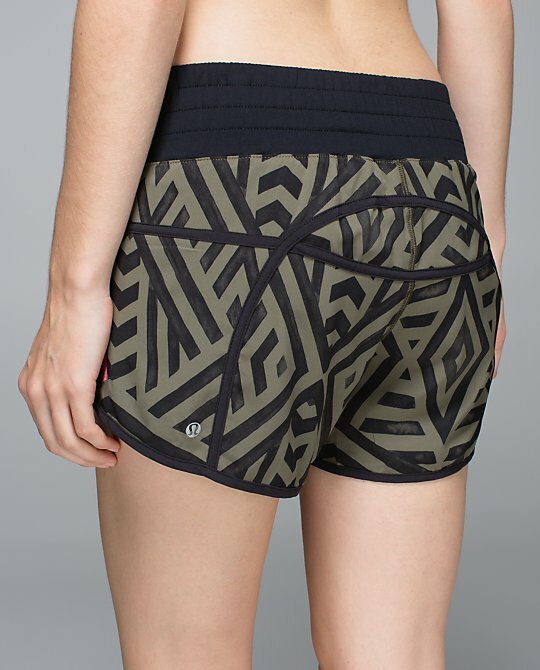 I got the shanti hipster in paradise grid with the triangle top. The shanti surf sports top - fit really funny - was not a fan. I'm usually a size 4, went up to 8 as per clerk's suggestion, too big. The 6 was perfect for me in the top and bottom. YES I am a B cup, this is not a swim suit for anything bigger than that - sadly. Glad I tried them on in store, rather than buying online. I like the bottoms as they have an adjustable waist band - nice touch for swim bottoms.